Last Friday’s nonfarm payrolls report of 215,000 new jobs in July with its attendant announcement of an unemployment rate of 5.3 percent drew mostly yawns from the media. 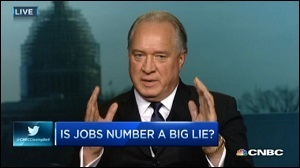 That wasn’t the case on February 3 of this year when Jim Clifton, CEO of the polling company, Gallup, wrote a stunning opinion piece on the company’s web site calling the U.S. unemployment rate “The Big Lie.” Clifton raised more media frenzy the next day when he appeared on CNBC and suggested he might “disappear” for questioning the government’s unemployment rate. Back then, the official unemployment rate was 5.6 percent. Today it’s 5.3 percent – a very healthy looking rate for an economy that is supposedly on the rebound. Even for a government hell bent on putting the best possible spin on overcoming the Wall Street train wreck of 2008, which brought on the worst economic slump since the Great Depression, characterizing someone working one hour a week in a lawn job as “employed” seems like the height of duplicity. We decided to check it out. We went directly to the source: the Bureau of Labor Statistics (BLS), the Federal agency that calculates who is employed and who is not. According to the BLS, the bogus nature of who is counted as “employed,” is even worse than Clifton suggests. Not only is a person counted as employed if they are working one hour a week in a lawn job paying $20, but a worker who makes no money at all donating his or her services to a family business for 15 hours or more per week is also considered employed. Throughout the rest of America, one’s donation of services typically defines one as a volunteer not an employed worker; but the BLS doesn’t see it that way. “Garrett is 16 years old, and he has no job from which he receives any pay or profit. However, Garrett does help with the regular chores around his parents’ farm and spends about 20 hours each week doing so. “Lisa spends most of her time taking care of her home and children, but she helps in her husband’s computer software business all day Friday and Saturday. The tricked up unemployment rate helps explain why the labor force participation rate is at a 38-year low of 62.6 percent. According to the BLS, July 2015 seasonally adjusted data show 93,770,000 individuals not in the labor force. That compares with 91,975,000 not in the labor force in July 2014. How can the economy and unemployment situation be improving when droves of workers are dropping out of the labor pool? Blaming the anomaly on retiring baby boomers does not explain what is happening to working age men and women. In July 2014, there were 35.5 million men aged 16 and older not in the labor force. Today, that figure stands at 37.5 million not in the labor force, an increase of exactly 2 million men of working age. For women aged 16 and older, in the same span of time, their nonparticipation in the labor force has grown from 54.9 million individuals to 56.2 million. The dismal labor force participation statistics are completely consistent with a tepid economy that can’t get out of the mire of 2 percent annual GDP growth, negligible wage growth, extended periods of unemployment (28 weeks versus the typical 16 weeks in the two decades prior to the 2008 crash), sluggish consumer demand, collapsing commodity prices and persistent warnings of the threat of global deflation. Update: Labor force participation data for July 2014 has been updated to reflect the seasonally adjusted number.